DOCSIS 2.0 with speeds of up to 25 Mbps on a wired connection. Not compatible with future speed increases. What does this mean?DOCSIS 2.0 has a maximum speed of 25 Mbps on the Cox network. Cox recommends a DOCSIS 3.0 16x4 or higher device for optimal Internet performance. The Arris / Motorola SB5100 includes the following connection ports. 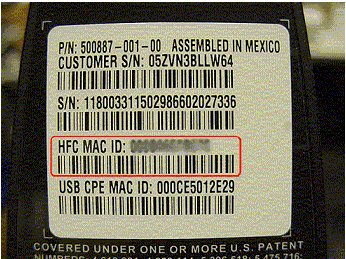 The HFC MAC ID is the MAC address. POWER Off No power. Verify the power supply connections, the power switch on the modem itself, the electrical outlet, and make sure the outlet is not connected to a switch. Flashing An error has occurred during normal operation. Verify all cable connections and try resetting the modem. Flashing Modem is searching for a cable connection. Verify all cable connections and try resetting the modem. Fast Flashing Modem Searching for cable connection. If this is a new modem or a replacement modem, contact Cox with the MAC address. If there are several MAC addresses on the modem, use the HFC or RF MAC address. Off No connection cable connection. Verify all cable connections and try resetting the modem. SEND Flashing Scanning for the upstream frequency. Verify all cable connections and try resetting the modem. ONLINE Flashing Scanning for the network connection. Verify all cable connections and try resetting the modem. ACTIVITY Blinking None. Transmitting or receiving data. For more detailed technical information on the SB5100, use the resource below from Arris.